"When things are difficult, art always flourishes." In July 2016, British recording artist and dancer FKA twigs sent out a series of tweets calling for Baltimore residents to join her for a free, one-day dance workshop. Over 400 people showed up at the city’s Lithuanian Hall, which twigs designated as a safe space for the duration of the workshop. She declared them a community, there to work with each other and grow together in creativity. Presented by WeTransfer, Baltimore Dance Project is a short documentary that captures this unique event. For twigs, this kind of shared creativity represents the pinnacle of human connection. Baltimore Dance Project is mesmerising, radical and emotive in a way that fans have come to expect from the diminutive, chameleon-like artist. 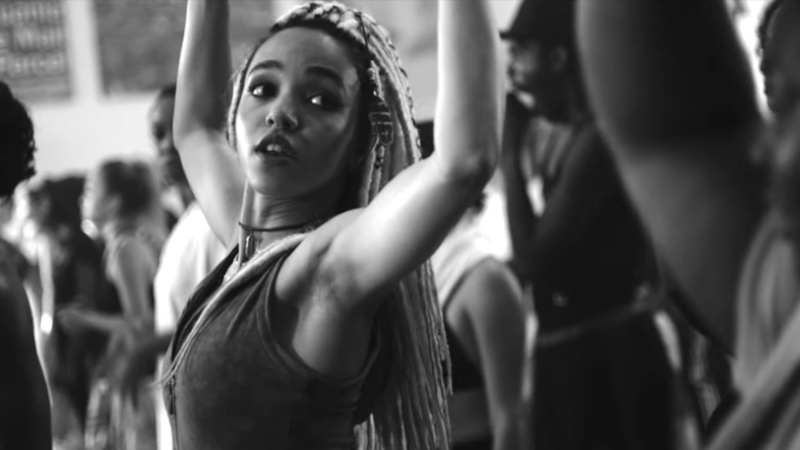 Presented in black and white, the 8 minute-long feature follows twigs, her choreographers and hundreds of dancers as they use their physicality and creativity to connect with one another. Featuring lingering, slow-motion shots and fluid choreography, the short effectively captures the day’s intensity, ingenuity and emotion. After the workshop, twigs invited select dancers to perform on the Baltimore leg of her tour in an effort to promote homegrown artistry. Rather than let her celebrity create a barrier, twigs, who began her career as a professional dancer, made sure she engaged as a participant in the workshop. As her choreographers Ramon Baynes, Kash Powell and Dominic Lawrence, led the throngs of dancers through the different routines – dancers whose capabilities ranged from intermediate to advanced – twigs took to the floor with them, sharing the space with a diverse group that she was responsible for bringing together. You can watch the documentary in full here and see the trailer below.